Knock out a few walls, have a few built-ins made, tile the floors, hang a fabulous crystal chandelier ......... yeah, not going to happen on my budget. These are all probably way out of the realm of possibility, but I love certain elements of each that might work for our humble walk-in. It looks like I'm leaning toward light and airy and feminine - sorry, Keith! 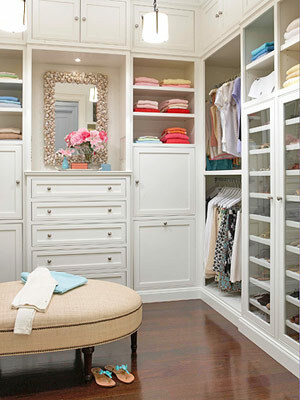 These are some amazing closets. I certainly could use a better closet. Those are some great closets! Let's see, first I need to magically expand my closet to walk-in size ... sure. :) Maybe just a new shelf. Good luck with your planned renovation. Oh to have space for something like this! I'll even take a walk-in! P.S. - SO excited for your referral!! Are you by chance using America World? I used to work there and have good friends adopting from Ethiopia through AW! I can only dream about that. Unfortunately my reality is two closets with bi-fold doors. Yuck. These are all gorgeous! I keep wanting to wallpaper my closet, get new lighting and reorganize. Fairly inexpensive ways to make a huge difference! Can't wait to see what you decide on! I'm drooling! 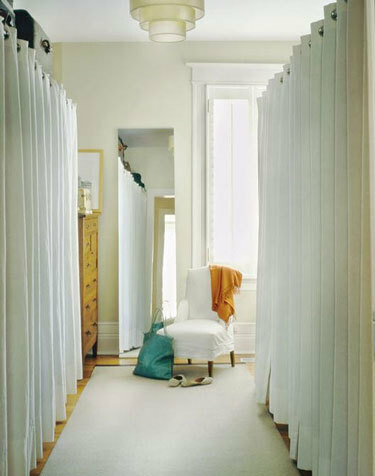 Large room to convert into closet is definitely going on my "Must Have" list for my next house. Wow! those are some incredible closets! Do you have that much space to work with? I once saw someone who turned their whole entire spare room into a closet. I WISH our house was big enough to do that! These make my heart pitter patter! I must have a closet room! Maybe if I close my eyes, tap my feet together, and say that three times it'll come true? AND...I'm awarding you the "Stylish Blogger Award" for your inspiring and fab blog! This award is passed on from blogger to blogger. I received the award from someone, and I'm passing the award to you. Part of this award is to write seven things about yourself (in your blog post) and pass this award to 15-ish other recently discovered blogs you think deserve this award too. You need to check out this closet! It's one of my friends whose husband is a woodworker. It's functional, beautiful, and will probably fit in many houses that are on the market right now. Sundi - I used Krylon silver metallic paint. After it dried I watered down a dark brown "oops" paint (not sure of the color) and brushed it over the dresser. I rubbed it around until I liked the look. Hope that helps! I converted my office into a dressing room, I found myself rarely using the office and I desperately needed more space for clothing! It's still a work in progress and hopefully the husband will be taking real photos this weekend, but I thought I'd share!